As a Catholic school, Resurrection-St. Paul School views faith formation as an integral part of our curriculum. 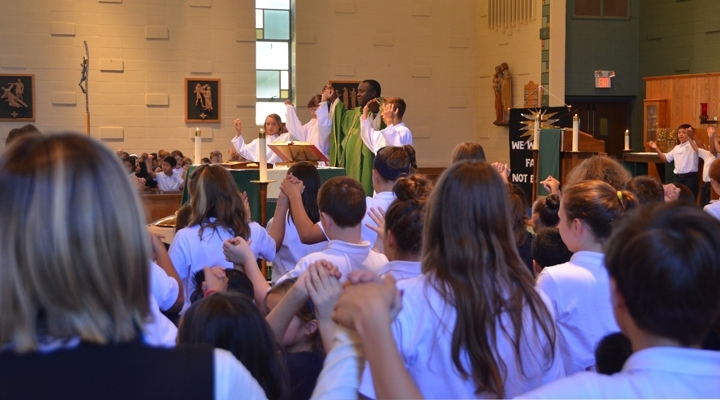 Students attend Mass on a monthly basis as an entire school community. Numerous prayer services and retreat experiences are held for students during the year celebrating the liturgical seasons. Additionally, in an effort to help students learn to be silent and listen to the word of God, all students are given the opportunity to participate in Eucharistic Adoration as a class every 3 weeks. To encourage active student participation in services, each Mass and prayer service are prepared by students on a rotating class basis. Non-Catholic students and those younger than 3rd grade attending Mass receive a blessing from the Eucharistic Minister or Priest during communion. Students in 2nd grade receive sacramental preparation for their first Reconciliation and Communion in their parishes and is supplemented during religion class at school. Students will receive these sacraments in the spring. During our May Crowning Mass, 2nd grade students wear their First Holy Communion attire and serve as Honor Guards for our May Queen (an 8th grader elected by her peers to crown the statue of Mary).